10 athletes from M&M competed as part of a 70 strong Kent Schools team at the English Schools Athletics Championships in Birmingham. The so-called “Olympics for school age athletes” is held over 2 days and is the 4th largest annual single sport event in the world. The standards are incredibly high, so winning a medal or making a final is major achievement and a list of past winners reads like a “who’s who” of British Athletics. 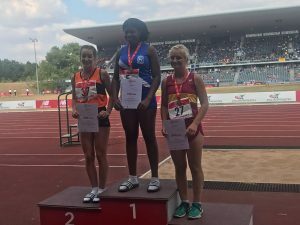 Competing in the Junior Girls Discus, Zara Obamakinwa recorded a big throw of of 37.79m to take gold, while in the Senior Boys Shot Putt, Jack Royden won a bronze medal with his longest putt of the competition measured at 13.47m. To match the medals won in the throws, Ellie Turner won a bronze medal in the Senior Girls 100m with a time of 11.92 into a slight headwind and then ran the second leg for the winning Kent 4x100m relay team. These 2 medals together with her silver over 200m from last year, give her a complete set in her final year at this competition. There were also fine performances from Ashleigh West who jumped an outdoor pb of 1.75m to finish 5th in the Senior Girls High Jump and Mayong Tabe who also jumped an outdoor pb of 5.76m to finish 6th in the Intermediate Girls Long Jump. 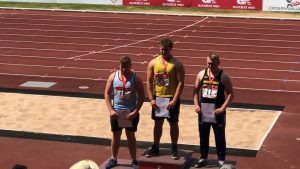 Also achieving 6th pace finishes were Gypsy Nash with a throw of 41.58m in the Junior Girls Hammer, Harry Blake with a throw of 42.05m in the Junior Boys Hammer and Josh Oshunrinde with a time of 11.10 in the Intermediate Boys 100m. Sadly, Ben Blake was dq’d in the final of the Intermediate Boys 400m hurdles after stumbling at the last hurdle whilst contesting 2nd place and hampered by an injury Alex Marshall could only make the Senior Boys 100m semi-finals and then saw the final won in a time slower than he has recorded this year.